Well, there is little debate to the number one reason why anyone should collect wine corks: It means opening and finishing a new bottle of wine, which is one of those divine moments in life when our heads misalign and all is right in the world. Isn’t a bottle of wine just the smoothest, sweetest way to share an evening with the one you love, with an old friend, with a complete stranger? It’s a human connector and inhibitions lubricator and, wow, don’t it taste just grand. But, we shouldn’t digress. The idea isn’t why we should be producing more used wine corks but rather why we should be keeping those we just effortlessly come by. No one really needs a reason to drink more wine, but perhaps we could use a little incentive for not tossing the corks (or bottles) afterward. Wine corks are super handy, crafty collateral damage from fueling our beverage habits, so we should be sure to save them. Less a collection than an immediate acknowledgment of a special event, be it an anniversary dinner (or proposal) or new friendship or a night worth remembering. And, while they may seem mundane, for anyone who has carried keys without some sort of keychain, we know they are quietly useful. Record the date on the cork with a marker, or for those with more artistic talent, go for something more creative. Twist a tiny eyebolt into the end of the cork and put a key ring on it. How nice would it be to receive such a simple, honest gesture, to know somebody wants to commemorate a special moment shared. What an honor! Try a red wine and chocolate pairing for those romantic nights. Personalized stamps could go many directions. For those wine connoisseurs with children, they could have an extensive, entertaining selection of shapes, letters, number and whatever else, or for adults into that sort of thing (no judgment here), this could make for some cool keepsakes. Carve the round end of the wine cork so that the shape that is to be transferred remains raised. Then, buy yourself an inkpad, or many if getting colorful is your game, and start a-stamping. For those into craftiness, this is a great way to make a signature marker, something more interesting and less pretentious than a signature, for all the things you do. This vineyard put its personal stamp on thing by being the first openly vegan wine company. Granted, there is a finite amount of people who need string spools: seamstresses, cross-stitchers, cobblers maybe, macramé enthusiast, tiny rope makers, and we all get the picture. Odds are, for some reason, we all have string around for something, or even an assortment of tiny cords and cables that could use straightening up. Corks make excellent spools because the ends can be notched such that the string or cord can be slipped into it and held in place. This means no annoying unraveling or fiddly work getting the end of the string affixed to something. Organizing things just makes life (and cooking) so much easier. They are a costly little luxury that can easily be made DIY-style, making romantic living room fires flame up easier and vegan sausage-roasting campfires something beyond simple. 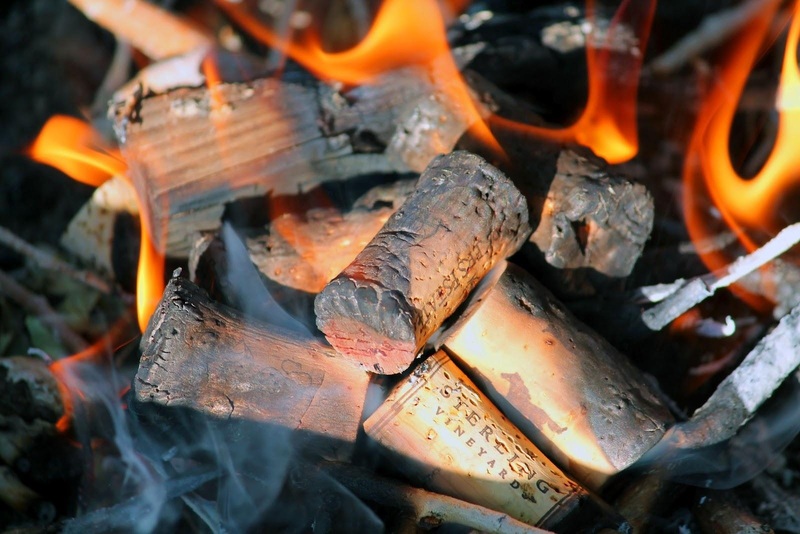 Corks are a great size for fire starters, and for those with easy access to them, say working in a restaurant, this is a great little upcycle to do. First, save a good collection of corks. Soak them in a container with alcohol, and they’ll easily absorb the solution, thus becoming an instant fire igniter. Store them safely in a jar or a leak-proof something. When it’s time to fan the flames of something, these little starters will burn long enough to get things going. These starters would be perfect for firing up a DIY rocket stove on the patio. In the crafty world of DIYers, wine corks are almost like an adult version of building blocks. They are a stylish filler of spaces, open to being shaped and molded, as well as are accepting of pokes, prods, spikes, and pins. In other words, for creative minds, wine corks make for some quietly cool art projects. They can be glued together in shapes, such as hearts, stars, states and many other things for quirky wall hangings. They can be formed into sculptures of animals, stringed together to form chandeliers or painted into curious characters with pins for hair. They can even be appealing fillers in the cavities of coffee tables or what have you. Here are some more fun art projects that can be done with upcycled materials. Rolled up, pressed cork mats are pretty familiar to most of us. We’ve seen them as placemats, pot stands, bulletin boards, and coasters. So, for just about everywhere we’ve seen the mats in use, a swankier wine-cork version of the whatever can be made. It just takes a base, some glue and a collection of corks. All it takes to make cork mats of all sorts, from bathmats to drink coasters to welcome mats, simply find a durable material, such as shelf liner or old linoleum. Some folks cut the corks in half. Then, it’s just arranging the corks in the pattern you’d like, gluing them down, and there it is. Who knew a bunch of corks could look so fine! Here are some more ways to green up your bathroom items. Wine bottles are worth saving. Wine corks are worth saving. Wine, for those who have iron wills, is worth saving, at least for a while. There are wins and wines flying all over the place. My son brought me a wine barrel from California, I\’ve decided I will not die until I fill it with corks (I\’m a healthy 65 female). I am also making wine bottle walls on my front porch, eventually, it will act as a greenhouse!